My wife and I recently had the pleasure of visting the Long Beach area home of long-time collectors Gregg and Yvette Spatz. Their home is a shrine to the work they love and a true inspiration to visit. They collect from many sub-genres of the art world with the main focus of their collection on illustration based works, especially those that have been covers of comics and/or featured in the annual Spectrum books which highlight the best and brightest from the world of fantasy driven art. I have been interested in art ever since I can remember. I took art classes back in Junior high and high school, but sports ended up winning out in the end. I would buy the Boris Vallejo Fantasy calendar every year to hang in my room, because I was interested in body building and Fantasy art and those calendars were the perfect mix of both worlds. I have been lucky enough to own two of his paintings now. The dawn of the computer and the internet is what got my interest going forward with my art collecting to what it is today. No one in my immediate family collects or creates art, but my wife Yvette shares the passion with me. We actually went to art galleries and museums while we were dating and carried the passion into our collecting after we got married. I am so lucky to have a wife that is willing to put up with me spending so much money and time into art. It takes a really special person and you also know that, having Shawn share the art with you too. Andrew, I see todays art movement continuing to reach even higher levels. This art movement has shown even with a downed economy it can still move upward and outward. It seems like all the major artists have continued to sell out their shows. There has also been a big jump with illustration and Comic Book artists moving over to the gallery scene. It is their way to do some of the work that they can’t do for publishers. This also helps keep the art movement moving forward and not getting stagnate. I do worry though, about too many galleries opening and causing some of the work out there to get watered down. There are tons of yet to be discovered artists out there, but some are being thrust into the gallery scene when they shouldn’t be. With this genre of art gaining in popularity, price points and awareness, there’s a fear amongst some collectors that what we have held dear and close for so long, may well soon be torn wide open and new collectors and gallery players will start hunting about for ‘the next big thing’. Any feedback to that notion? Galleries have always looked for the next big thing, but the trend has been getting worse with the advent of the internet. It is just easier today to hunt down talent over the computer without even leaving the gallery or your home. This just increases the competition level between galleries. The first piece Yvette and I bought together was a Cibachrome print of “Mermaid Dreams” by Wyland and Jim Warren. It was just a beautiful painting and there was no way for us to afford the original. It now hangs on a wall in my parents house. We also have not bought any prints since. 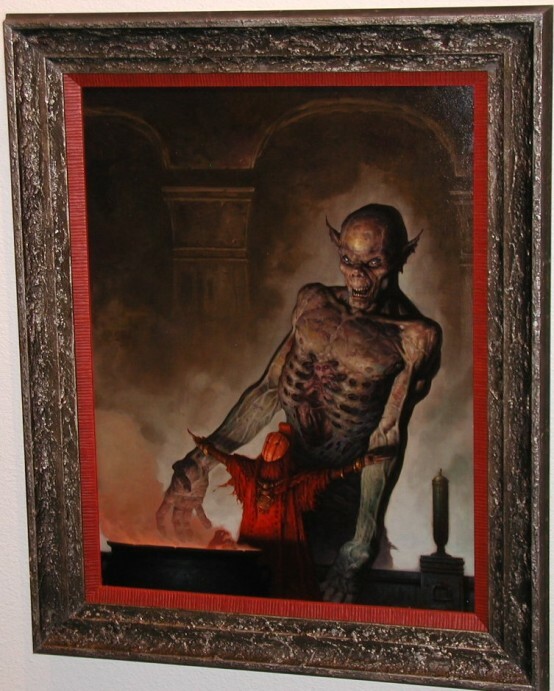 The first major painting we bought was “Allure of Damnation” by Brom. It is just the perfect chick painting! 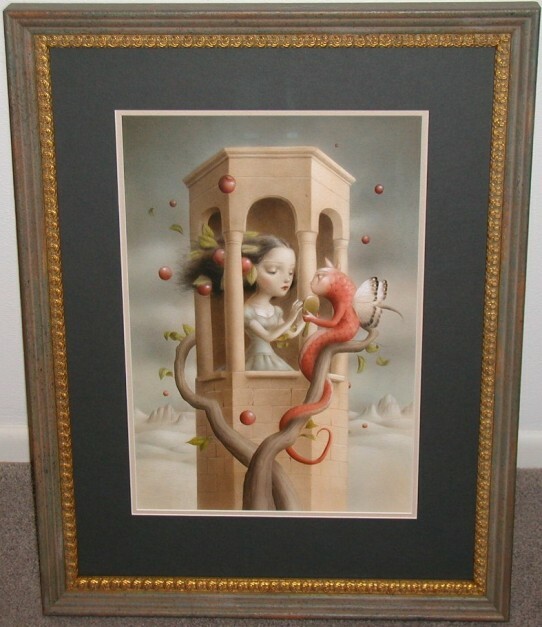 Brom is also one of the best Fantasy artists in the world and we were very lucky he still had this painting available. It has been used for calendars, books and tee shirts. We do have two great sculptures by local artist Lisa Snellings Clark. her work can be scene in some volumes of the Spectrum series art books. We also own a piece by Ver Mar, a huge green Ogre by Kim Graham and numerous “Day of the Dead” pieces and masks. We also used to collect Mexican folk art. I really can’t say that I have a favorite piece, but can tell who some of my favorite artists are from the collection. This may sound like a cop out, but is not. Each guy has his own unique style and can’t be compared to each other. Brom, Phil Hale, John Jude Palencar, Chris Mars, Todd Schorr, Donato,Jon Foster, Justin Sweet, Boris Vallejo, Julie Bell, Dan Dos Santos, Dave McKean, Alex Gross, Ian Miller and Rick Berry. I hate leaving anybody out, but just can’t name them all. The best scores of 2009 are not even in the house yet. I have a Batman commission coming in July from Phil Hale and an Alex Gross painting arriving whenever I can pay it off (actually it’s arrived since and it’s amazing / pic below – editor). I have been waiting years for Phil’s piece and if you have every seen any of his previous Batman pieces you would know why. He is just a genius of an artist! Mark Ryden! His work is the best of illustration mixed with fine art. “The Creatix” by Mark Ryden. I was able to see this painting a couple of times and it was the best one for just too many reasons to name. I know you are a huge fan of comic book and graphic novel derived work and are a huge follower of the Spectrum series. There is such a wealth of amazing talent in the illustration field, just aching to be discovered and shown in proper gallery spaces. Name one artist that might be off the radar of most, but that has consistently blown your mind and you feel is worth a shout out. I just can’t name one. I just keep discovering new illustration guys all the time. Some of these guys are new and some may have been around for a while, but keep a lower profile. Wade Furlong (a comic book guy that has his own very unique style. Also was just accepted to be in this years Spectrum), Jon Wayshak (been doing comic book work lately, but not afraid to push the envelope with his style or visions), Chris Rahn (does some very nice gaming art using oils or digital), Michael Ryan (very nice spooky oils). Just get a copy of the last few issues of Spectrum and see how many great artists there are out there. It will blow you away! I need to give a huge shout out to Arnie and Cathy Fenner for doing such a brilliant job of publishing that series! It has been very instrumental for our collection. The next collector profile will be published shortly. Stay tuned, we’ve some great interviews in the works. What an astonishing collection! And what dedication it took to compile it! It must be incredible living in that household environment day to day. I don’t know how Gregg and Yvette walk down the hall without stopping every two feet. PS– Gregg is a lucky, lucky man to have a wife who happens to share his consuming passion. If she didn’t, this collection would spell trouble with a capital T.
This is an amazing, robust and deeply interesting collection. And it was interesting to hear from one of the collectors. It’s a bit too bad about the photos, though. And Gregg is lucky to have such a dishy wife. It was a very sunny day which made picture taking a bit difficult not to mention it was rather dark in much of house and I did best I could. Hoping to have a better camera come the next interview/visit I do, but these aren’t bad considering the environment and not having proper lighting. The link to their works provides better pics to most of the individual works too which is nice. I love the Alex Gross, the pictures are awesome, thanks for sharing Greg & Yvette’s fascinating collection. Very well done! I agree with Suzette, very well done Andrew. Thanks very much for the opportunity to share our collection. I’ve seen this collection live and was not only totally impressed but also the diversity has inspired my own creative juices. Can’t say enough about Gregg and Yvette’s passion for the collection and artists. And yes, Yvette is dishey, Gregg is luckey! Knowing the amazing layout of the art in every room in the house, Andrew did a great job. Amazing people, amazing collection. It is an honor to be a tiny part of it. These collector interviews are great. They are the wonderful people who help keep the art world rolling. I’d never be able to support my art habit without them. Your collection is amazing! The Phil Hale pictures are awesome. Previous Previous post: Cannibal Flower 9 Year Anniversary this Sat!! !